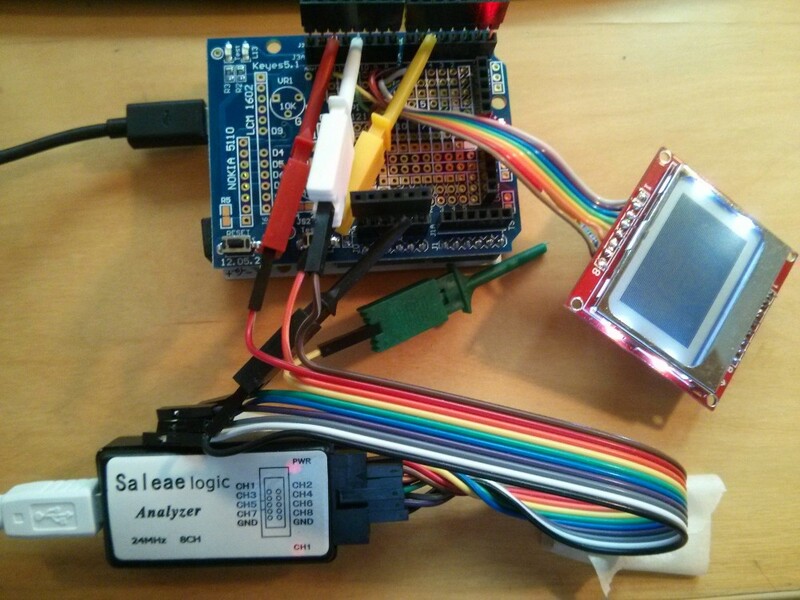 The Saleae Logic is an 8 channel 24MHz logic analyser. Soon after its launch people in China opened them up to find that they are pretty simple inside and, as sure as night follows day, little workshops in Shenzen started producing clones impossibly cheaply and to be sold through eBay, AliExpress, etc. The Real Deal from USA has a lovely CNC-machined case and retails for US$149 plus shipping. The Shenzen version costs about US$8 including shipping. It doesn’t come with a nice cardboard box, a carry-case, an aluminium alloy, CNC-machined enclosure (it’s moulded plastic) and you have to get your own clips to connect to the end of the ribbon cable (figure on another US$5 investment for those). In use the Shenzen version gets a little warm, so you can see some merit of a metal case although CNC-machining from solid billet and then anodising does seem rather over the top. And it’s US$8 including shipping. Eight dollars! Software support in Linux (sorry, Windows users, this article is not for you) is through packages such as sigrok or even, in theory, the software from Saleae themselves although some have tried that and it’s not working well for them with their clones. Saleae have posted their view (overview: they’re not happy about using their software with clone hardware) of the clones on their website. Sigrok is a pretty awesome suite of software and supports a wide range of interfaces / instrumentation between your circuit under test and your PC – from little USB logic analysers like the Saleae (and clones) through to digital multimeters and even DSOs. Apparently support for my Owon SDS7102V oscilloscope is underway – looking forward to that! Note that some of these are quite humungous (like the Qt SDK) – make sure that you have a few GB free before embarking on these package installations. I also had to download, build and checkinstall the latest libusb-1.0 since it’s required by libsigrok to talk to just about all USB-connected signal sources. Select Saleae Logic from the listbox on the toolbar. (Optional) Select Decoders from the menu and choose a protocol decoder that works for your circuit under test (I chose SPI) and you may need to click on the protocol decoder trace to logically connect signal connections to protocol lines. I connected up one of the standard Nokia 5110 Arduino projects and hooked up a couple of channels as per the above to decode SPI. It took me longer to document this than do it! Whilst getting the software installed for Ubuntu was no walk in the park compared to the usual Ubuntu Software Centre point-and-click affair, the whole package works really well and, for the price, it’s unbeatable. Hats-off to Joel Holdsworth, in particular, for a very fine job on PulseView.